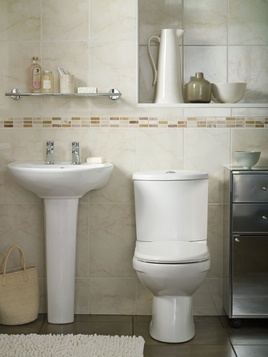 Sanitary ware manufacturer Healey & Lord reports phenomenal sales growth for its Sheringham Range of wash basin, slimline pedestal, Dura-seat & dual flush WC. Readily available to end users, stockists are reporting a high turnover of the product. "The compact suite is small enough to fit into most British bathrooms and stockists can hold sensible quantities as a result of the quick delivery time from placement of order," says Richard Gates of Healey & Lord. "Added to which it is a very affordable and stylish suite with an excellent quality finish of glaze. Stockists, who were at first reluctant to store product, have found their Saturday afternoon trading transformed as members of the public come in and take product away on the same afternoon." All of these factors give the independent stockists a real edge on the Sheds. Further support is given by quick technical back up and exclusivity zones can be arranged for stockists. The option of a one or two tap hole basin is also a key selling point.